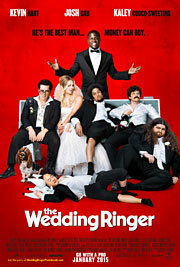 The premise for “The Wedding Ringer” has a blind spot the size of Texas. If someone were to actually do what Kevin Hart’s character does here, it would not be long before they ran into one of their former clients’ spouses, or a girl they hooked up with after the reception, or a family member of the wedding party (you get the idea), while pretending to be the new character. Not to mention, the movie wrings laughs out of a scenario where men spin a hideous web of lies to their wives-to-be as a means of impressing them, which is the worst possible way to start a marriage. It’s a house of cards, with a near-zero level of plausibility, and yet, “The Wedding Ringer” works in spite of all of these things. Hart and Josh Gad have great chemistry, the script is surprisingly smart for such a broad comedy (they don’t stoop to making the supporting characters dunces in order for the plot to work), and there is an underdog mentality to it that is intoxicating. Doug Harris (Gad) has a problem. He’s about to get married to out-of-his-league Gretchen (Kaley Cuoco-Sweeting), but he doesn’t have any friends, and therefore no best man or groomsmen. The wedding planner sniffs this out (Gretchen, conveniently, is still in the dark about this), and suggests that Doug meet Jimmy Callahan (Hart), who runs a business providing services for men who need a best man. Doug, however, doesn’t just need a best man: he needs a best man and a whopping seven groomsmen, something Jimmy has joked about but never executed before. The groomsmen Jimmy recruits are less than ideal, but Doug goes along with it given the circumstances. As Doug and Jimmy get to know each other – Jimmy has a strict ‘This is a business arrangement, and we are not friends’ policy – and as Gretchen’s family gets to know Jimmy, lines get blurred.